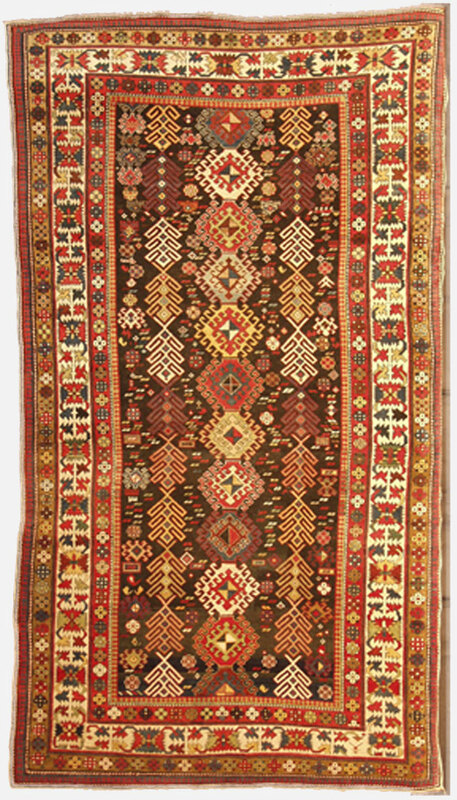 An unusual and striking East Caucasian item in a close Shirvan weave and a strong, heraldic field design. Against a shaded indigo background, three vertical rows of different shadows and symbols of Caucasian art are internally patterned with varying types of hooked diamonds and cruciform devices, held within stepped surrounds. The palette for this clear-cut arrangement includes terracotta, ivory, soft green, gold, soft blue and biscuit, together with some details in faded fuchsine, which assists in dating the item to the late 19th Century period. The ivory main border has a colourful and uncluttered meander of stylized rosettes detailed in ice blue, yellow, red, soft green, soft blue and maroon, this displayed between rose side borders and an outer saw-tooth stripe in ivory and dark red.